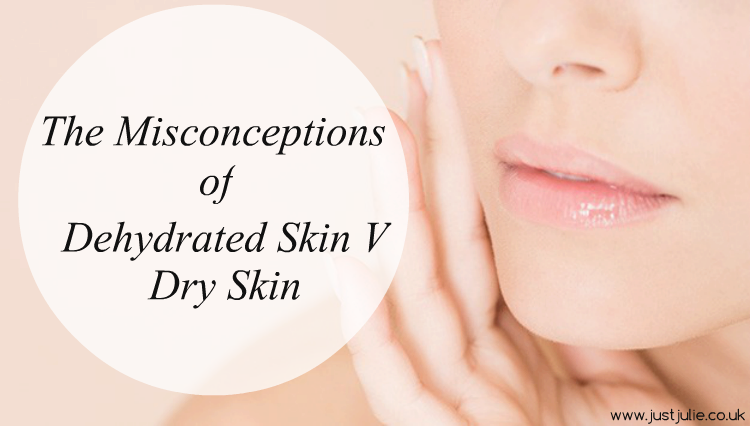 The Misconceptions of Dehydrated Skin V Dry Skin! As someone with oily skin that is also dehydrated it's important that I get the right skincare products for my skin type. Recently after being contacted by a brand I discovered that a lot of people do not understand or know how to deal with oily and dehydrated skin. I was left having to educate the supposed skin care expert, which lead me to realise that there is so much confusion with dehydrated skin and many people are being given products to treat dry skin instead, so today I'm going to talk to you about the differences between the two.. I'm not going to lie, I was left feeling very angry after a few emails had been exchanged between myself and a 'skin care expert' for a skin care brand. I was asked to explain my skin type and what my main concerns were and their expert would then pick out the most suitable products and get them shipped out to me for a possible review. My skin type is oily, however I have dehydrated skin. I'm also concerned with my skin ageing, so I look for products that will help balance out my oily skin, hydrate my dehydrated skin and also products that will help reduce the first signs of ageing. Now having worked in the beauty industry for years I know these aren't rare concerns, it can just be hard to find the right balance of products, which is pretty much the same for all skin types! The email I got back annoyed me. "Your very strange and rare skin type has left our skincare experts a little stumped as to what would be the right products for you to use" They then went on to recommend products that were aimed towards people with dry skin! So called skin care experts ay?! Dry skin is a skin type. You can't completely treat it and change it as it's something we were born with. You can only control your skin type. However your skin type can change as you get older. Dehydrated skin is a skin condition. Skin conditions can be treated, as normally they are caused by outside conditions, eg, dehydrated skin is caused by lack of water. Sometimes skin conditions can't be treated though and stay with you for most of your life. As I said dehydrated skin is a skin condition, not a skin type. Lack of water in the skin is the main cause for dehydrated skin, also your lifestyle and diet can play a huge factor. Dehydrated skin is normally found in people with an oily skin type. It can be a caused by using products that are quite harsh, in which they strip out all the oil from your skin. Skin feels tight and dry, yet still have oil breakouts throughout the day. It can also be flaky. Skin has no bounce to it and fine lines can be more prominent. By the end of the day makeup can look patchy due to your skin absorbing all of the water from your makeup and products. Dehydrated skin can create more oil to make up for the missing water in your skin, which can lead to breakouts. Dry skin is usually a skin type, one you were more than likely born with and therefore can only be controlled. You wont suddenly wake up one day with oily skin after using extremely rich moisturisers.. Lack of oil in the skin is the main cause for a dry skin type. Skin feels tight and dry after washing, and it can feel quite uncomfortable in some severe cases. Skin can become very flaky. Dry skin soaks up products very quickly. You normally have dry skin in other areas of your body. Skin looks dull and lacks luminocity. Treating dry and dehydrated skin is very different. In less severe cases of dehydration normally a slight lifestyle change can make a huge difference, which can mean switching up your diet, drinking more water, cutting back on alcohol, cut back or quite smoking and ensuring you get enough sleep. If you make those changes then in time your skin should naturally hydrate itself. In the mean time using the right products is a must. Avoid products with sulphates, as sulphates strip your natural oils. Avoid leaving skin bare after washing it. Moisturising skin immediately will seal in the water. Don't use foaming cleansers and opt for cleansers that are more gel like, as these normally carry more water. Look for products with Hyaluronic Acid, which helps to retain water in your skin. Humectants (water magnets) and alpha hydroxy acids which are great for hydrating and exfoilating. Try to use moisturisers that have a gel like consistency, as these tend to sink in to the skin better, and they also help to retain the water in your skin, all whilst not adding too much oil in to your skin. Try to exfoliate your skin only once a week. Try to look for products that are hydrating and avoid using products that are rich in oil. Look for water based products, as these help to hydrate but don't cause your skin to produce more oil. For dry skin, lifestyle changes can help, but only to a certain extent. Drinking more water helps, as does eating certain foods like Avacados, which are a great source for vitamins C and E, which help your skin to lock in moisture. Eating more fish, vegetables. nuts and fruit all will help your skin. In fact eating all of those will help all skin types. Reguarly exfoilate your skin to get rid of dry, dead flaky skin. Use moisturisers that have emollients in as they put a protective shield over your skin, preventing loss of moisture. Look for ingredients such as shea butter, Jojoba Oil, Ceramides and Sunflower Seed Oil, which all help to produce more oil in the skin. Moisurise skin as soon as you have washed it. Opt for lotion/cream like cleansers. If like me you suffer with oily, dehydrated skin but are also concerned about the ageing process, then I really recommend steering clear of anti-ageing moisturisers as these tend to be be very rich in moisture and are more geared towards those who have dry skin. Instead opt for a hydrating, oil free day and night moisturiser and invest in a good anti-ageing serum to use underneath your moisturiser, day and night. This way your skin gets some anti-ageing products (serums ingredients are more concentrated and tend to work deeper than moisturisers) as well as a good hydrating moisturiser. That way you are treating all your skins concerns, without using anything too rich. Check out my Top Picks | Eye Creams for my favourite hydrating and anti-ageing eye creams. Also have a read of my Current Skincare Regime for some great hydrating and anti-ageing products. My skin care regime has only changed slightly, but all of those I listed in that post are fantastic. The main change has been my moisturiser, which is the Lancôme Hydra Zen Neurocalm Cream-Gel which is amazing at hydrating skin! Don't get me wrong, I'm no expert in Skincare, but I hope that I have helped people distinguish between the two and realise that dehydrated skin is NOT a strange and weird skin condition. Have you ever been given the wrong skincare advice from an 'expert'? if so let me know in the comments.